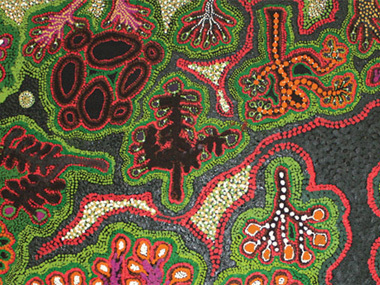 Our Mob 2013 is a statewide celebration of South Australian Indigenous art and artists. This annual event is now in its eighth year and offers a superb exhibition and program of events that offer engaging experiences for people of all ages and backgrounds. Our Mob generates a sense of pride and inclusion for South Australian Aboriginal artists who share their stories of place, country, identity and family in individual ways. Our Mob is the culmination of arts activity throughout the state, with more than 100 artists from across South Australia exhibiting their work in the Artspace Gallery. A wide range of art will be featured this year including sedge grass weaving by Ellen Trevorrow, photography by Arabunna artist Reg Dod and rising star James Tylor, paintings and ceramics from the APY Lands, and many more. Young Indigenous artists will again participate in Our Young Mob, with works from 40 artists under 18 being exhibited in their own exhibition in the Festival Theatre Foyer. Student works come from Port Lincoln High School, the Wiltja School and its residential programs where young people from all over SA come to Adelaide for their education. Their art depicts bright, strong images that centre on themes of homeland and family. An Indigenous Writers Day will be held on 25 October from 10am – 4pm in the Artspace Gallery, convened by Alexis West and featuring presentations from leading and award-winning Indigenous Australian authors and storytellers. An Introduction to Photography Workshop for Indigenous Artists will take place in Adelaide Festival Centre’s John Bishop Room on 25 October from 9.30am – 4.30pm, led by emerging photographic artists James Tylor and Coby Edgar and covering the fundamentals of digital photography as well as a brief history of Indigenous photography. The Indigenous Art Symposium, a forum for artists, arts workers, students and art devotees, will feature discussions led by established and emerging Indigenous artists and will cover topics such as new media, Indigenous art practices, copyright and licencing, and much more. Taking place on 26 October from 11am – 4pm in the Lyrics Room, the day will also feature a dance performance by Wiltja Residential Program students. The Our Mob 2013 exhibition will be on display in Adelaide Festival Centre’s Artspace Gallery from 25 October – 15 December 2013. An official opening event will be held on Friday 25 October from 5.30pm in the Festival Theatre Foyer with Our Young Mob exhibition, followed by a celebration in the Artspace Gallery for Our Mob. This will include the inaugural presentation of the Don Dunstan Foundation Our Mob Emerging Artist Prize, which provides support to an emerging artist through a cash prize of $5000 and a professional development opportunity from Country Arts SA to the value of $1500. The evening will also feature musicians from the Centre for Aboriginal Studies in Music. Our Mob is proudly presented by Adelaide Festival Centre in conjunction with partners Country Arts SA, Ananguku Arts and Culture Aboriginal Corporation and Arts SA.